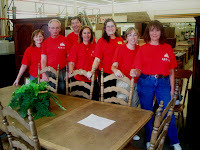 In recognition of the first KW RED Day, several shifts of real estate agents and their associates from Keller Williams Realty in Leesburg invaded the ReStore in Purcellville on Thursday, May 28th to help with cleaning, stocking, displaying merchandise in the store and preparing online ads to increase sales.KW RED Day was organized on an international level to recognize the 72nd birthday of Mo Anderson, Vice Chairman of the Board of Keller Williams International, and her amazing commitment to community service. The leadership of Keller Williams International firmly believes in giving back to the communities each office serves and has many programs in place to encourage this.RED is an acronym for Renew Energize and Donate; and the motto for the day was “Giving Where We Live”. You can read more about Keller Williams Realty, and about RED Day at www.kw.com/REDDay. Keller Williams Realty boasts a consistent record of holding the highest market share in real estate sales in Leesburg; and provides all types of real estate services. For more information please contact Vicky at 703-669-3142 or email her at vchrisner@kw.com.